A North Yorkshire charity has recognised the valuable contribution of its workforce in the community by launching an annual “Support Assistant of the Year” award scheme. 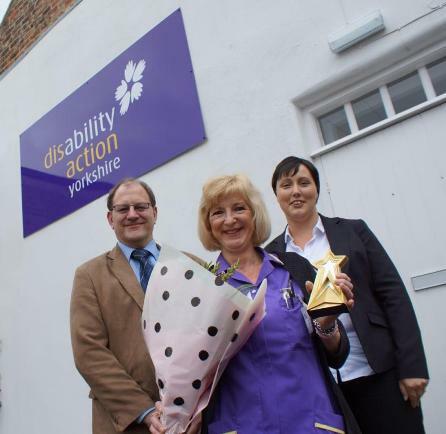 Disability Action Yorkshire, whose Home Care team is based in Chapel Street, Thirsk, has named Heather Fleetham as its first winner of the title. Heather, from Sowerby, has worked for the organisation for the past five years, which carries out a wide range of duties and services to people living in their homes in Thirsk, Northallerton, Bedale, Richmond, Easingwold and Ripon. “We have created this award to recognise the invaluable work our team of carers undertake in and around the Thirsk area. “We asked the staff to put forward nominations and Heather was the runaway winner. She is very highly thought of by everyone in the Home Care team, as well as by those she helps look after on a daily basis. Disability Action Yorkshire chief executive Jackie Snape said: “Our Home Care team does sterling work, and its efforts are very much appreciated by those who continue to live in their own homes thanks to the help and care they are given. Disability Action Yorkshire, which was started in 1937, owns a residential care home on Harrogate’s Claro Road for adults, aged between 18 and 65, with physical disabilities. It also runs a training centre at its Hornbeam Park headquarters, for disabled adults who are wishing to gain the skills and experience to help them into employment. Further information about the opportunities available within the Home Care team can be obtained by contacting Karen Minteh on 01845 574519.